This month we don’t just have a Speak UP parent of the month. We have a Team of the Month! 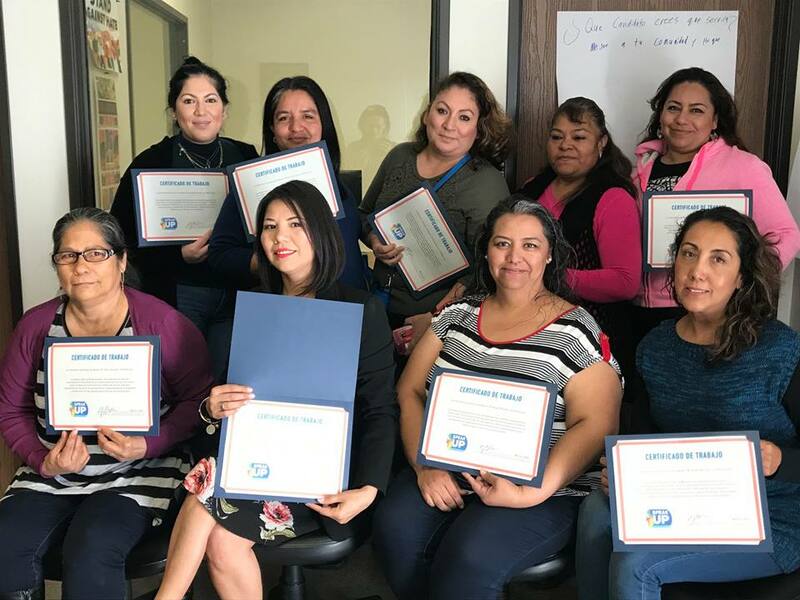 This incredible team of moms from all over Board District 5 and beyond has been working for two months on a campaign to make sure their community knows about the special election for LAUSD school board and to encourage their community to vote. Rain or shine, our team of moms came to canvass with positive energy, and they had incredible results. Together, they worked almost 400 canvassing and phone banking shifts. They have shown enormous parent power and are inspiring us to continue our work to put kids first! Thank you Elia, Brenda, Angelica, Norma, Alma, Maria, Perla, Laura and Silvia! Perla Esparza is a tireless parent advocate for kids with special needs and a frequent volunteer at her child’s school. She has led the charge in southeast Los Angeles to get out the vote for the next school board District 5 representative, alerting her community to the need to have its voice represented. Thank you, Perla, for everything you do! Justine Gonzalez has been a fierce and fearless voice for equality, diversity and parent empowerment. Justine spoke up for the rights of parents in the Southeast of Board District 5 to have their voices heard in the selection of their Board representative. After realizing that no parents of LAUSD children served on the LAUSD Board, Justine, the parent of an LAUSD pre-K student, decided to run herself. While this transgender human rights activist, who has worked for two Los Angeles mayors and served as President of the Human Relations Commission, ended her bid for financial and family reasons, she remains an advocate for the rights of L.A.’s most vulnerable kids. And she’s now running for Assembly District Delegate at the California Democratic Party on the Working progressives slate. Best of luck, Justine, and thank you for speaking up on behalf of parents and kids! Maria has four children who graduated from Maywood Academy in Board District 5, and her children are all in college now. Maria has been a parent leader and community advocate for more than 10 years. She has advocated for the rights of parents and kids before the LAUSD Board, and she is currently serving on Speak UP's candidate interview panel for the Board District 5 special election. Thanks, Maria, for your dedication to helping L.A. kids! Emma runs the support group “Un Paso Más,” which means "an extra step." Thanks, Emma, for partnering with Speak UP to help empower parents in Huntington Park! Chantel, a parent of two kids in Board District 4, participated in our parent-teacher working group. She's a fierce advocate for equity and social justice in education. Thank you, Chantel, for always speaking up on behalf of LA's kids! Raquel spoke up on behalf of an open, transparent and democratic process to fill the vacant Board seat in District 5, where two of her children currently attend an LAUSD magnet school. She is always looking for ways to improve public education in her community, and we were so impressed with her passion and dedication that we invited her to join our Speak UP team. So please welcome, Raquel, our newest parent engagement coordinator! Annie Hall has been an active parent leader in Board District 1. With three grown children and five more that she has fostered, she recently advocated for better education for South LA students at an LAUSD Board meeting. She also spoke up and spoke out strongly against Donald Trump’s immigrant family separation policies at The Keep Families Together: Rally and Toy drive organized and co-sponsored by Speak UP at the Federal Building in Westwood. We are grateful for Annie’s dedication and leadership on behalf of our most vulnerable kids. Congratulations to Rosa and Ada, the first “Speak UP Parents of the Month." Speak UP is proud to work with these two remarkable moms who speak up and advocate not only for their own children, but for all children with severe special needs. In one week’s time, they collected over one hundred signatures to support special needs centers, spoke at the LAUSD board meeting and organized workshops and house meetings for parents in their district. Rosa and Ada, you are an inspiration to us all. Thank you for your fierce resolve to get things right for our kids.